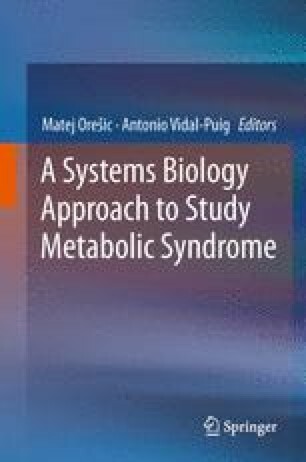 Skeletal muscle metabolism shows a considerable number of alterations in the Metabolic Syndrome (MetS), these most probably linked to the development of insulin resistance. The muscle of obese subjects and type 2 diabetic patients shows lower capacity to take up glucose, to convert it into glycogen, and to oxidize it by mitochondria. In addition, muscle in these individuals shows a higher capacity to take up fatty acids, mainly as a result of increased lipid availability. Muscle shows impaired insulin signaling, and most data point to altered IRS protein activity as a result of enhanced phosphorylation in serine residues by protein serine kinases. Inflammation, excessive lipid availability, and oxidative stress have been proposed as potential causes to explain muscle insulin resistance in the MetS. A major question pending in the field is the identification of the primary causes of this disorder and the identification of the major pathways responsible for the development of insulin resistance and for the metabolic alterations present in skeletal muscle in humans. We thank Ms. T. Yates for editorial support. This study was supported by research grants from the MEC (SAF2008-03803), Grant 2009SGR915 from the “Generalitat de Catalunya”, CIBERDEM (“Instituto de Salud Carlos III”), FP7-European Commission (MITIN, HEALTH-F4-2008-223450), and INTERREG IV-B-SUDOE-FEDER (DIOMED, SOE1/P1/E178). A.Z. was the recipient of a Science Intensification Award from the University of Barcelona.